They sure look creamy and delicious…. but don’t be fooled… it’s another vegetable – cauliflower?? I will admit my kids have never been a fan of “white broccoli”, as they like to call it. 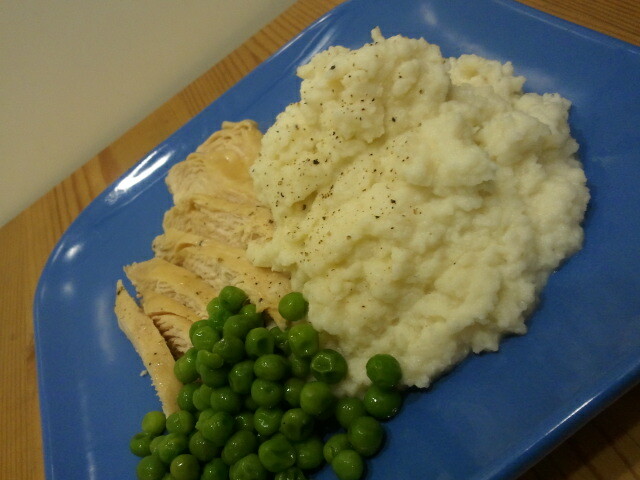 But transformed into what appears to be mashed potatoes, I have pulled one over on them. My advice for successfully replacing mashed potatoes with cauliflower mash, is treating them exact way you would your mashed potatoes. Don’t leave out the butter or sour cream! By taking the potato out of the mix you are already eating a healthier alternative, so do not hold back on the flavors! You can doctor them up any way you like. Here is my personal favorite recipe…. Peel leaves off of cauliflower, remove stem and cut into florets. Steam cauliflower about 10-15 minutes, or until tender. Place cooked cauliflower, butter and yogurt into food processor. Mix until smooth. Stir in desired amount of freshly grated parmesan cheese. *one of the necessities to this recipe is the food processor – it helps to ensure a very smooth and creamy end result. 11 Responses to Are those mashed potatoes?? We have done this at our house and with all the condiments, they even taste like potatoes! I haven’t put mine in the food processor so they don’t feel like potatoes, but will get it out for the next batch! Thanksgiving maybe and see if anyone notices! I can’t believe that i managed to fool everyone with those ,the hole family thought they were mashed potatoes.Thanks to you now we eat healthy .Thank you! I am dairy free also, and this sounds so good that I will try it with olive oil, nutritional yeast and dairy free cream cheese? Ill let you know soon. Wow look so grate . Please more recipes !!!! Mashed potatoes or cauliflower, it looks fabulous! This is more healthier than mashed potatoes!